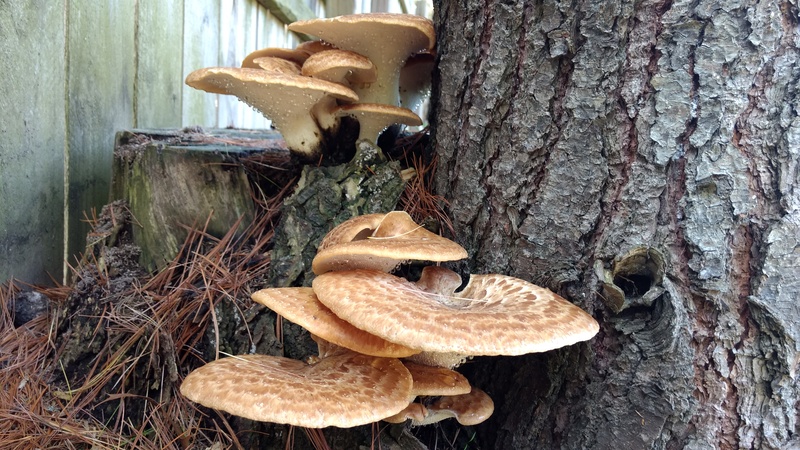 Don’t like Dryad’s Saddle? You’re probably cooking it wrong. Dryad’s saddle, also known as Pheasant Back, fruits prolifically in the spring and fall. But many foragers ignore it, claiming it is too tough and flavorless. Which it kind of is, if you harvest older mushrooms and fry them in butter. It’s important to harvest these mushrooms young. The best time is when they are dripping. And to really appreciate their flavor you need to use them for soup or gravy. Chop them up fine and let them simmer and you will be rewarded with an intense, rich flavor that few other mushrooms can match. 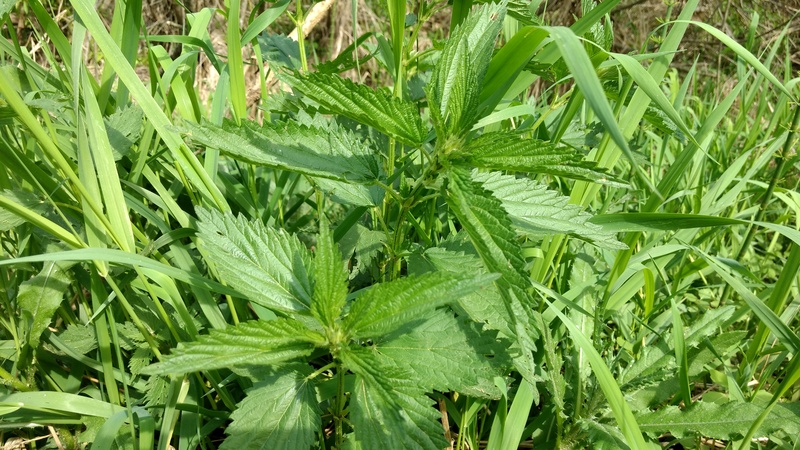 Nettles are one of my favorite plants. They are extremely nutritious and versatile. They are used commonly by herbalists in teas and tinctures to promote overall health. They work well as a seasoning in culinary herb blends. And they can be used in soups, stir frys, pasta dishes, as a side dish of their own, and anyplace else you might think to use cooked greens. The mild flavor pairs with just about anything. They can even be used in salads. Just steam them for a few seconds, or better yet, put them over a smokey fire to deactivate the stings. Asparagus is shooting up. As you can tell, it is difficult to get a good photograph. 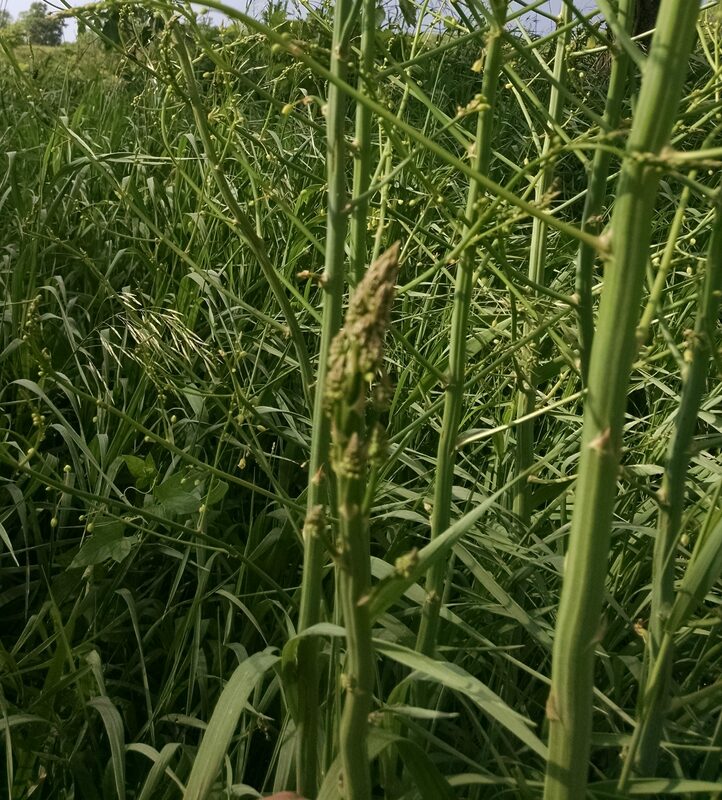 This is because the asparagus stalks are very narrow. 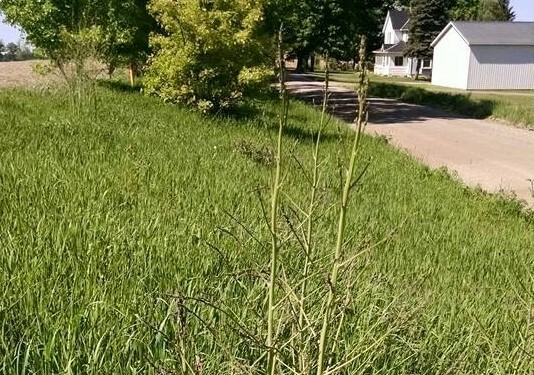 It is just as difficult for your eyes to see in real life because they tend to blend into the surrounding grasses. If you don’t know where to look, finding the stalks when they are still young is like searching for a needle in a haystack. So look for the female stalks sticking up above the grasses and then search around the base for younger shoots. And then make a note of the location so that you will know where to look next year. There are 2 types of plantain. One has long narrow leaves and the other has rounder leaves. 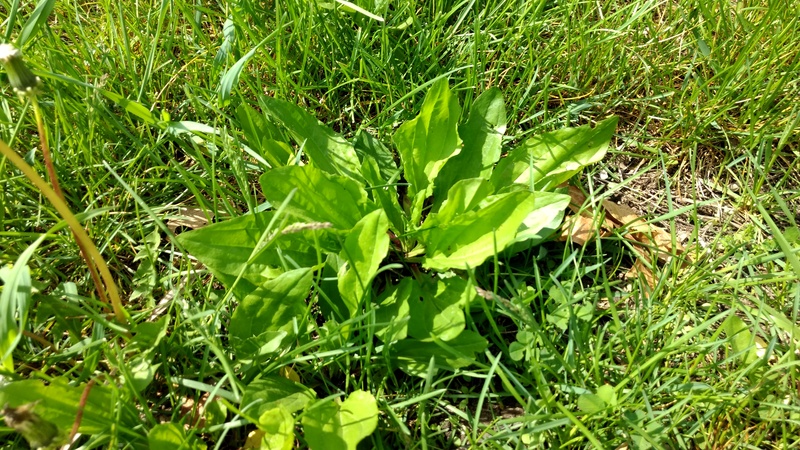 Both form basal rosettes, have parallel veins running the length of the leaves, and are common in lawns, parks, and disturbed areas. They also both produce seed heads on long narrow stalks that like to get stuck between your toes when you walk barefoot. And they both are used medicinally as a topical astringent and antibacterial. The leaves can be used fresh as a poultice or a wash or extracted to make a salve. 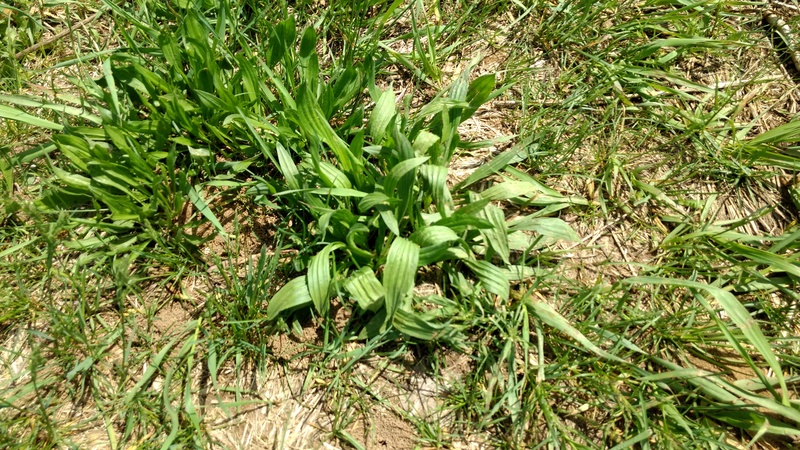 Plantain can be used to treat insect bites, hives, rashes, scrapes, cuts, burns, and slivers, and is a staple of our medicine cabinet, replacing things like first aid cream, neosporin, and calamine lotion. 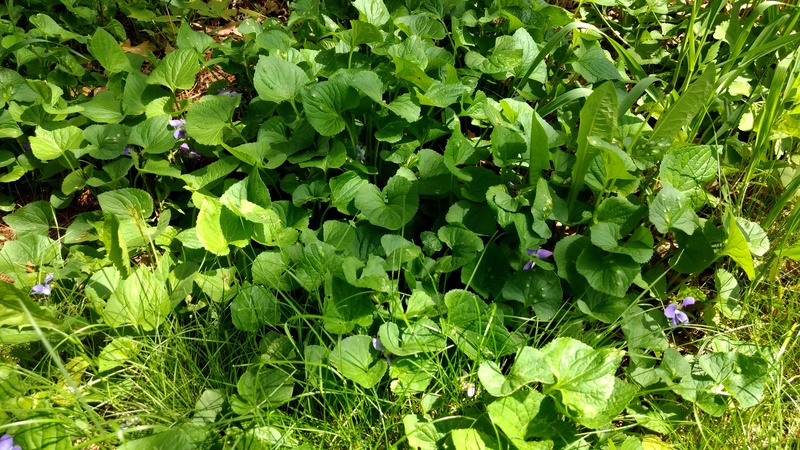 The violets are still going strong. Many people like to make candied violet flowers or violet jelly. Both are fun, beautiful, and will impress your dinner guests. But really they are just fancy sugar. There is definitely something to be said for foods that are pleasing to the eye. Colorful foods make us happy (think Doritos or gummi bears). But if you are only using the flowers you are missing out on the best part of the plant. The violet greens are what I harvest the most of. They are a wonderful spring salad green, easy to find, and easy to pick in abundance. And unlike most greens, the flavor remains mild even after the plants flower. Typically I pick the greens and flowers together and then leave the flowers in the salad- for the color. Another colorful edible flower is the red bed. These trees seem to be designed specifically to make us feel good. They put on a beautiful show of vivid pink-purple all along their branches, and from a distance it almost makes the trees look like they are surrounded by pink fog. And then, as it finishes flowering, tiny bright green hearts pop out everywhere. 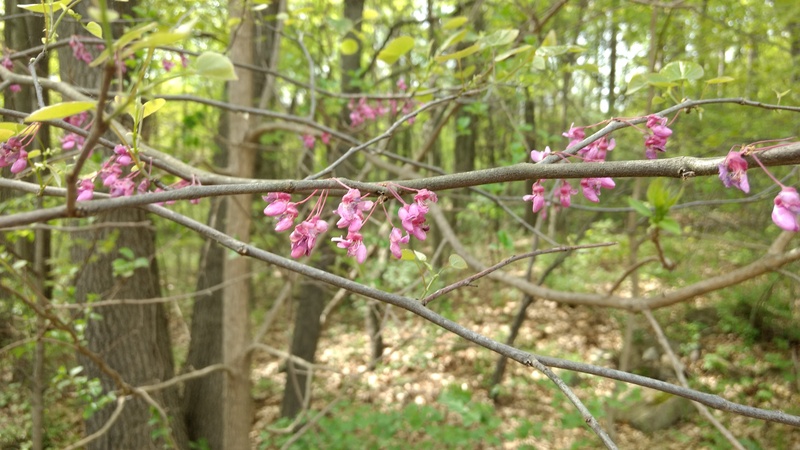 The redbud flowers are edible, and taste very much like raw peas. 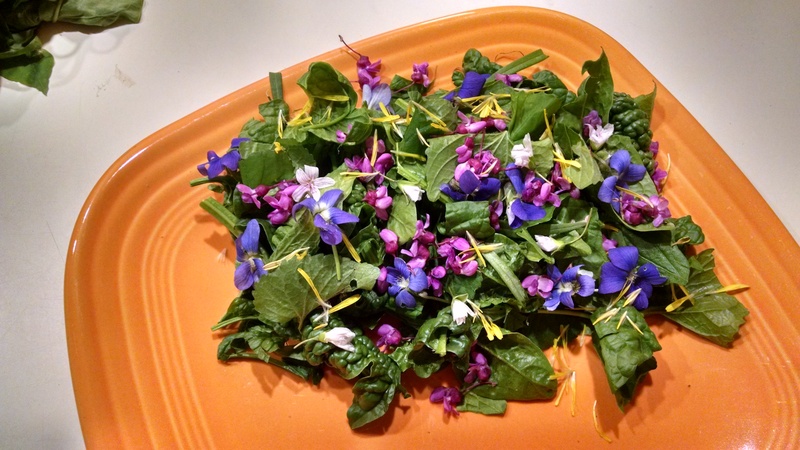 So throw some on your violet and wilted nettle salad, maybe add some dandelion and garlic mustard greens and some dandelion petals. Learn more about wild foods. Grab one of the last spots for the 5th annual Great Lakes Foragers Gathering. Find out how to harness wild yeasts at Microbe Camp. Or learn to find and cook gourmet meals at Forage and Feast Camp. Check out our upcoming events page for details. Want more seasonal recipes and foraging tips? Don’t miss a post. Join the email list to get wild food recipes and regular updates on seasonal foraging conditions in southern Michigan and the Great Lakes Region. No spam, just local foraging info.